One of the most important jobs in the Cambridge and UK economy is currently being advertised. Cambridge Enterprise, the body responsible for commercialising the University of Cambridge’s intellectual property, is seeking a Chief Executive. Cambridge Enterprise is responsible for looking after the university’s stake in patents, spin out companies, looking after the university’s interests when consultancy advice is offered by university staff and making investment decisions with the university’s “seed fund”. The University of Cambridge has been improving what it has been doing in the “technology transfer” in recent years; but it is still far from fulfilling its potential. The recent EEDA Cluster Report stated that the University of Cambridge and the economic activity connected to it will be worth £57.5bn in GDP and 154,000 in new jobs over the next decade. If the appointee succeeds in their role we could see not only this contribution to the national economy improved, but the university’s financial positioned strengthened for the future (perhaps even putting it in a position where it would not have to charge tuition fees for UK undergraduates) and society as a whole benefiting more from the outputs of research carried out at the university. in support of a community of world-leading researchers, inventors and entrepreneurs. This raises the question of who this individual will be working for, and who commercialisation of university research is intended to benefit. The researchers, inventors and entrepreneurs within the university are actually only one group of people with an interest; there is also a public interest in terms of the a national economic interest, as well as the interests of the university as an institution and the interests of humanity as a whole. The consideration of who this person, and Cambridge Enterprise, ought be working for leads to the question of who ought make the appointment. Perhaps government, in the form of the Department for Business, Innovation and Skills should have a say, perhaps the appointment should be confirmed by the BIS select committee and MPs given the chance to explain what the nation expects of the organisation and its leader? I would like to see the new CEO of Cambridge Enterprise push for further reform of the university’s arrangements for taking a share in the profits of commercialising research outputs. Currently there are rules set out for the share in the royalty interests in a patent taken by the researchers, department and university but if research is commercialised by incorporating a company there is no such framework and negotiation is carried out in a haphazard manner. There are other bizarre elements of the university rules, including a provision which could allow the university to make a claim of ownership IPR created by two students working in collaboration, even if the students’ activities had no relationship to any course or research they were carrying out at the university. I understand the university is unlikely to make such a claim, and there is a route of appeal within the university if a claim is made unreasonably, but I suspect the chilling effect of this rule on innovation is underestimated. My view is the university ought only have a claim if significant university resources were invested in and required for the creation and development of the IPR. I would also note that students’ rights under the IPR policy are rendered almost worthless by the disparity in power, resources and influence between the institution and individual students. Particularly given most students are seeking a qualification from the university, and there are no procedures in place to protect the interests of students raising complaints. A key role of Cambridge Enterprise is to pick which innovations from within the university it is going to help commercialise. I think that Cambridge Enterprise needs to be very aware that academic researchers have a very unique perspective in seeing value in intellectual property and might want to see Cambridge Enterprise assign the rights back to individual researchers so they can continue to build their academic careers, perhaps in other institutions, on the back of work done at Cambridge. I think Cambridge Enterprise needs to be strong, to stand up to academics, and to protect the interests of the nation and the university in such negotiations and to understand the motivations of the academics. Cambridge Enterprise needs to be aware that universities in other countries are on the ball and actively seek to recruit even quite junior researchers, to an extent effectively offering them academic positions in return for the commercialiseable IPR which they bring with them. For a researcher getting Cambridge to unconditionally hand them the IPR they’ve generated at Cambridge, can be a major career boost. Cambridge University and the UK higher education sector more generally should perhaps be playing this game too. We should be the poachers; encouraging academics with promising ideas to move to the UK to develop and commercialise them. Cambridge Enterprise should be spotting ideas with potential before the technology transfer organisations at the institutions where the researchers are working do! I think there are far too many excellent innovations with the potential to either make money, or simply improve the lives of people around the world through better healthcare or more environmentally sustainable living which languish within universities and never escape. Cambridge Enterprise should see its role as helping ensure what is done within the university has an impact on life outside of it. Too often though the arrangements in place have the opposite effect. Postdoctoral researchers in particular are in fear of being exploited, not least by the professors the university’s arcane structures require them to interact with the institution and wider world through. Too often, despite being in publicly funded roles, nominally working in the interests of society at large, individuals make decisions in the interests of their own personal circumstances and academic careers rather than for the benefit of the institution, the country, and the human race. I would also like to see Cambridge Enterprise challenge the culture of academics running “nominal” companies which exist only to give research councils some, false, impression that a route to commercialising and exploiting their research exists. The culture that university staff, especially professors, deserve the opportunity to make a bit of money on the side from their access to university facilities, and from their position also needs to be challenged and in this area of “consultancy” Cambridge Enterprise too needs to stand up to the university’s academics and not see itsself as subservient to them. Here to an extent its role is in the prevention of corruption and I would like to see Cambridge Enterprise to have a good working relationship with Cambridgeshire Police and resulting in a culture where those who consider abusing their position within the university are made aware that if they did justice would be done. One of the big problems with academics making a bit of money on the side from their consultancy or innovations is that too often they get the scale wrong. They are often very happy with making a few tens of thousands as a bonus, and their main benefit is they can use the fact they have a company to support them in their academic role. Technologies which could change the world end up languishing and doing little more than supporting one individual’s academic lifestyle. Cambridge Enterprise’s role ought be to shake this culture up. Lastly, I see no reason Cambridge Enterprise should limit its activities to those within the university who are creating intellectual property. If Cambridge Enterprise was doing its job well it ought be able to aid with the commercialisation of IP from any source, it should see its self as competing with the likes of IP Group PLC and that competition should be real; Cambridge inventors should be genuinely free to opt for alternative routes to commercialisation and Cambridge Enterprise’s offering ought be attractive to, and open to, all. Technology transfer used to be one of the legions of well paid non-jobs within universities which are largely designed to frustrate the purposes of the institution. I think we’re still in a period of transition from that position to where we ought to be, and the new chief executive of Cambridge Enterprise has a fantastic opportunity. However I doubt the Cambridge academics and private equity investors on the board of Cambridge Enterprise, who will ultimately make the appointment will select someone who has the desire and drive to take that opportunity. Who ever does get the job will have their predecessor looking over their shoulder, the previous CEO, Ms Teri F. Willey, remains a member of the Cambridge Enterprise Board, this may well put a dampener on the opportunities for a revolution. Cambridge Enterprise is wholly owned by the University of Cambridge, so subject to Freedom of Information. 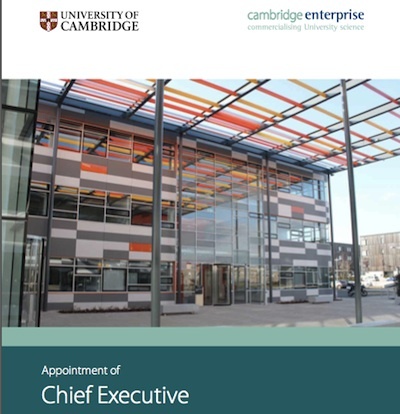 I have therefore thought it reasonable, particularly given I have commented on the document, to make a copy of the additional information for the role of Cambridge Enterprise Chief Executive available via my website. The document can be obtained from http://www.perrettlaver.com quoting reference 0909, the job was advertised in the Sunday Times on the 24th of July 2011 which was where I saw the advert. The deadline for applications in the 30th of August. This entry was tagged Innovation, Public Money., Tuition Fees, Universities, University of Cambridge on July 27, 2011 by Richard Taylor.